Cinco de Mayo Celebration - Enjoy Latin music, mariachi bands, dancers, crafts and family fun. Tryouts will be held February 9, 2019 at 5:00 pm. Attire ~ black sports bra ,black shorts or briefs, flesh tone tights, NO SHIMMERY TOAST ! No jazz pants ,no long tights! Please cover any visible tattoos . Shoes of your choice . Makeup and hair must be on point ! Please have a 1 minute solo put together for round 1 . Also be aware that if you make the team you are expected to stay after tryouts to go over contracts and schedules . Please read the flyer ,there you will find what you will need to bring to tryouts and the location . Although the flyer states that this is an individual audition once you make it to round 2 then it will be come a group audition ! Any questions please email me prior to audition. Hello Everybody! Come out & see the Houston Halos girls at the 25rd Annual MLK Grande Parade. Event will be televised locally & nationally. Parades is expected to attract 300,000 spectators, so come early. The MLK Grande Parade is the third largest Parade in the U.S. behind The Rose Parade and The Macy’s Day Parade. Hello Everybody! Come out & see the Houston Halos girls at the 24rd Annual MLK Grande Parade. Event will be televised locally & nationally. Parades is expected to attract 300,000 spectators, so come early. Hello Everybody! Come out & watch the Houston Halos girls perform at the 17th Annual MLK Battle Of The Bands Competition. This Event will feature 20 Nationally Acclaimed High School Marching Bands from Around The Country. Hello Everybody! Come out & see the Houston Halos girls at the 12th Annual MLK Youth Parade. Event will be televised locally & nationally. 200,000 Spectators are expected and has a Viewing Audience of more than 4,000,000. Hello Everybody! Come out & see the Houston Halos girls at the 23rd Annual MLK Grande Parade. Event will be televised locally & nationally. Parades is expected to attract 300,000 spectators, so come early. Hello Everybody! Come out & watch the Houston Halos girls perform at the 16th Annual MLK Battle Of The Bands Competition. This Event will feature 20 Nationally Acclaimed High School Marching Bands from Around The Country. Hello Everybody! Come out & see the Houston Halos girls at the 11th Annual MLK Youth Parade. Event will be televised locally & nationally. 200,000 Spectators are expected and has a Viewing Audience of more than 4,000,000. Come & meet your HOUSTON HALOS perform with free photo taking opportunities. Free giveaways. Come and see the Houston Halos at the Houston Amateur Hockey Association Golf Tournament to benefit StarSkaters. Free giveaways, free autographs & posters. Meet your Houston Halos! Come out to meet the Houston Halos! Photos, giveaways & Cheers! Meet Your Houston Halos! FREE Photos, Posters & giveaways. Hello Everybody! Come out & see the Houston Halos girls at the 22nd Annual MLK Grande Parade. Event will be televised locally & nationally. Parades is expected to attract 300,000 spectators, so come early. Hello Everybody! Come out & see the Houston Halos girls at the 10th Annual MLK Youth Parade. Event will be televised locally & nationally. Parades is expected to attract 200,000 spectators, so come early. Hello Everybody! Come out & watch the Houston Halos girls perform at the STARskaters golf tournament. Bring a friend & watch Houston's newest cheerleaders burn the floor! 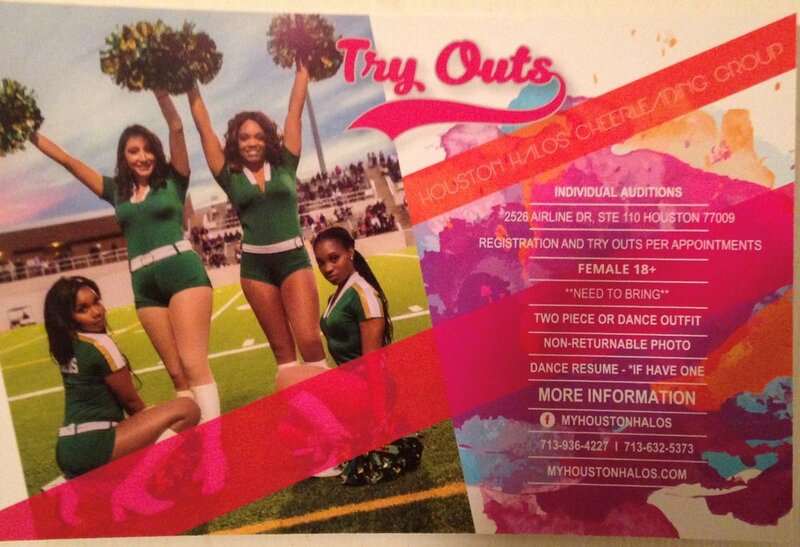 Come and see the Houston Halos perform live! We will be at Emeritus in Kingwood. There will be photo opportunities and we will be handing out autographed posters. Event will be televised locally & nationally. Parades is expected to attract 300,000 spectators, so come early. Hello Everybody! Come out & watch the Houston Halos girls perform at Wounded Warrior Project! Hello Everybody! Come out & watch the Houston Halos girls perform at the Abilities Expo. This is a free admission event. Pick up an autograph poster. Photo opportunities available. Learn more at www.abilitiesexpo.com and www.starskaters.org. Hello Everybody! Come out & watch the Houston Halos girls perform at Republic Harley-Davidson!